Discovery Channel To Document Life Of Evel Knievel!!! Discovery channel has found a new topic they hope will garner something close to the 13 million viewers it received when Nick Wallenda walked a wire crossing the Colorado River Gorge, broadcasting his running dialogue with God back in June. 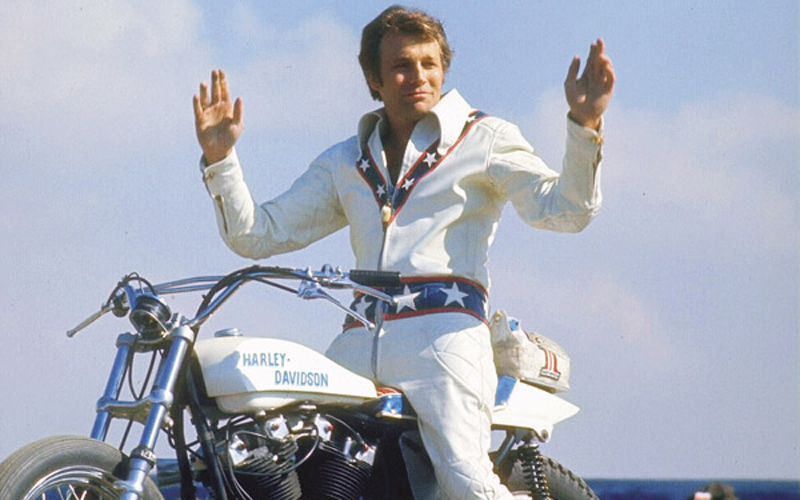 The documentary centers on the controversial life of none other than the motorcycle daredevil, himself, Evel Knievel. The documentary is set to air October 14 and is entitled ‘True Evel‘, which is being produced for Discovery Channel by Kowalski TV with Craig Coffman serving as executive producer for Discovery. The program will document Knievel’s steps through life beginning with his early childhood in Butte, Montana, then onto his rise from simple stunt man to an all-American brand. He has been cited as inspiration for countless entertainers since. He was the base for a line of toys and a Marvel Comic back in the day by doing his insane stunts all over the world. Archival footage and interviews with family, friends and colleagues will feature to demonstrate his rise from small-town upbringing all the way to his famous long motorcycle jumps in Las Vegas. The documentary will show how his final days were spent penniless. The good guy, all American hero had a different side, Discovery says. “He would tell kids – study, go to school, get good grades, treat your mom and dad right,” motorcycle racing star Skip Van Leeuwen says in the docu. “Two hours later, he’d be chasing 15 girls naked around his boat. It was nuts.” It’s only slightly ironic that Evel Knievel is described as “nuts”. Not sure if this will receive tons of viewers as the network is hoping, but it might garner some interest from new and old generations alike. I just hope that in each episode, there will be some sort of actual live stunt. This entry was posted on Thursday, September 26th, 2013 at 4:49 pm	and is filed under News, Television. You can follow any responses to this entry through the RSS 2.0 feed. You can skip to the end and leave a response. Pinging is currently not allowed.